Description: How did the New Testament writers and the earliest Christians come to adopt the Jewish scriptures as their first Old Testament? And why are our modern Bibles related more to the Rabbinic Hebrew Bible than to the Greek Bible of the early Church? The Septuagint, the name given to the translation of the Hebrew scriptures between the third century BC and the second century AD, played a central role in the Bible's history. Many of the Hebrew scriptures were still evolving when they were translated into Greek, and these Greek translations, along with several new Greek writings, became Holy Scripture in the early Church. Yet, gradually the Septuagint lost its place at the heart of Western Christianity. At the end of the fourth century, one of antiquity's brightest minds rejected the Septuagint in favor of the Bible of the rabbis. After Jerome, the Septuagint never regained the position it once had. Timothy Michael Law recounts the story of the Septuagint's origins, its relationship to the Hebrew Bible, and the adoption and abandonment of the first Christian Old Testament. 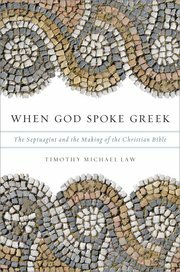 Citation: Martin R�sel, review of Timothy Michael Law, When God Spoke Greek: The Septuagint and the Making of the Christian Bible, Review of Biblical Literature [http://www.bookreviews.org] (2014).